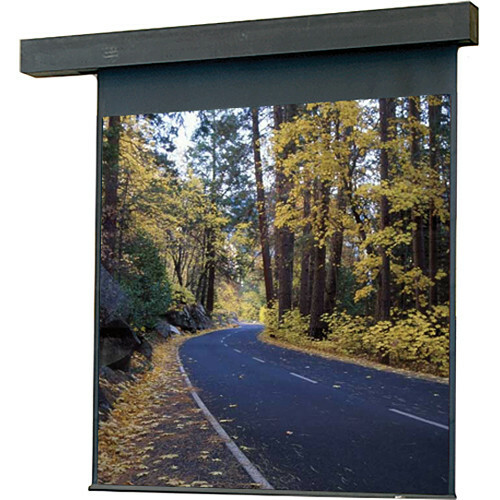 The Draper Rolleramic Electric Projection Screen is an excellent choice when you need a reliable and motorized screen for an auditorium or other such large venue. Whether you run a hospital, school church or learning center, the Rolleramic will serve you well. The stylish wood case can be painted to match its surroundings. In addition, the internal motor is designed with "dampers" so that any noise is kept to an absolute minimum. This is a large screen that is suitable for heavy duty use. A wide variety of remote options are available ranging from key operation to Infrared and RF controls. Draper products include rear projection display systems, video projector mounts and lifts, plasma display mounts, presentation easels and communication support furniture. Draper products are shipped to dealers throughout the United States and more than 75 foreign countries. Box Dimensions (LxWxH) 218.0 x 19.0 x 15.0"